How did Alexander form his military judgements? It is dangerous, in any age much before our own, to speak of a ‘general staff’, because to do so is to imply a bureaucratization of society quite at odds with reality. The general staff, officered by men selected and trained to perform intelligence, supply and crisis-management tasks, was a nineteenth-century Prussian invention. The Romans, via the cursus honorum, anticipated something akin to it. But mediaeval armies knew it not at all, while even the Renaissance and dynastic armies of early modern Europe were staffed at best by gifted amateurs, usually the friends or favourites of the commander. Alexander commanded alone, certainly maintaining nothing like the ‘three bureaux’ system – operations, intelligence, logistics – through which European armies of the last hundred years have been articulated. Nevertheless, he needed and used subordinate commanders, if only to control his detached armies, such as those sent ahead into Asia Minor before the invasion and left behind in Greece after it. He took surveyors, secretaries, clerks, doctors, scientists and an official historian – Callisthenes, a nephew of Aristotle – in his entourage, and he consulted anyone whose expert knowledge promised to enlarge his own picture of how the future could be made to fall out. As a boy at his father’s court he had closely questioned visitors from distant places about the topography of their homelands, and on the eve of his march into Asia was certainly one of the best-informed men in the Greek world. But between information and decision falls the shadow. Did Alexander find his way through the dark alone, or did he require the minds of others to guide him to the right choice of action? Alexander’s intimate friends, the inner circle of Companions, were by no means all hard-drinking highlanders, boastful and empty-headed. Ptolemy, the future ruler of Egypt, would write a history of the conquests; Marysas also became an author. Hephaistion, Alexander’s favourite, was the friend of scholars, and Peucestas, who was to govern Persia, took the trouble to learn the language and cultivate a knowledge of Persian customs. 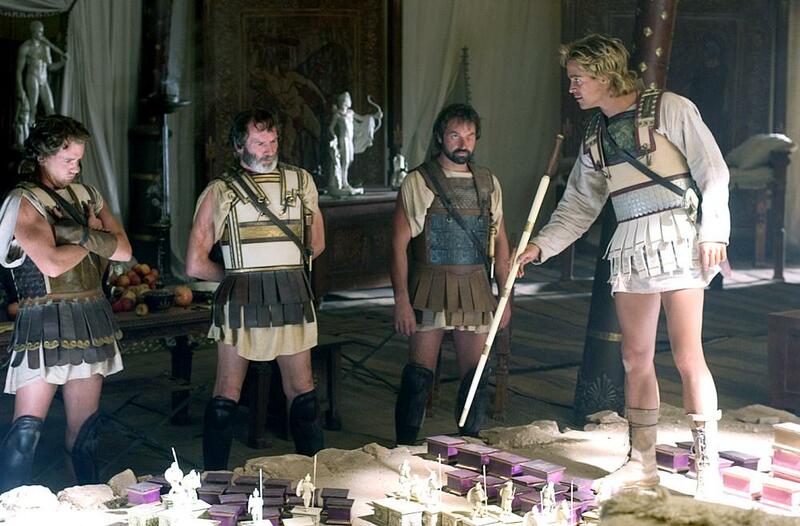 But our main sources give no real hint that Alexander used his circle of friends as a sounding-board for his plans. That was not their function: it was personality and character that were under test when Alexander was among his close Companions, the test of quickness of wit, sharpness of retort, memory for an apt phrase, skill in masking insult, boast or flattery, capacity to see deep into the bottom of a glass, and no heeltaps. When in doubt – and Alexander probably took the trouble to disguise doubt though he felt it but rarely – he turned to the most experienced professional at the court, Parmenio, to help him fix his ideas, using the old general’s temperamental prudence as a catalyst to precipitate his preference for the bold and immediate option. Arrian, whose biography is the most important surviving source, provides four specific examples of how debate was conducted at court, when Alexander locked minds with Parmenio and overcame his objections to pressing forward rather than holding back. Arrian’s testimony is of the greatest value; writing though he did 400 years after Alexander’s death, he worked from biographies and histories, now lost to us, written by Alexander’s contemporaries. Moreover, being a Greek himself, who as a high Roman official had governed and campaigned in exactly the area in which Alexander began his conquests, he was in close sympathy with both his subject’s character and his problems. Two of the reported Alexander-Parmenio debates are strategic in character, two tactical. At the strategic level the first concerned the policy to be adopted against the Persian Mediterranean fleet after the victory of the Granicus. The choice lay between a continental and a maritime campaign. Such a choice is a constant, recurring in all campaigns where sea- and land-power intermingle, as they must do in inland seas, as they have always done in the Mediterranean, as they notably did in Macedonia’s struggle against Persia. 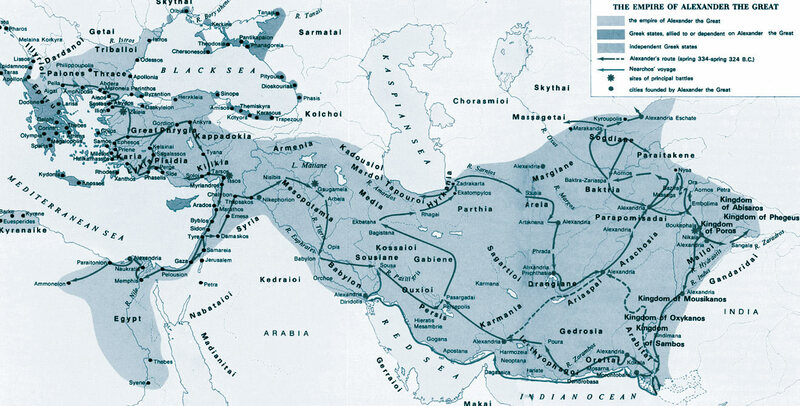 Persia, though maintaining a large Mediterranean fleet, was essentially a continental empire, whose control of its territory depended in the last resort on the superior strength of its army. Macedonia, though almost land-locked and only a recent entrant to the world of the Greek states, had thereby joined the ranks of maritime powers, in which strategists’ thoughts always turned on how superior land force might be negated by a stroke from the sea. After the victory of the Granicus, Alexander proceeded on a mopping-up campaign of those ancient Greek cities along the western coast of Asia Minor that had fallen into Persian hands. Ephesus – to whose future Christian congregation Saint Paul would write one of his epistles – and Miletus quickly fell to him. Three days after his small fleet had anchored offshore, however, the much larger Persian fleet arrived. Not only did its presence threaten his freedom of manoeuvre, it also menaced his communications with Greece, where the militant Spartans remained Persia’s firm allies. Parmenio therefore urged Alexander to seek a naval battle. ‘If they won,’ he said, ‘it would be a great help to the expedition generally; a defeat would not be very serious; [and] he was willing to embark himself and share all the perils.’ Brave words from a 67-year-old. But Alexander would not have it. Parmenio had not grasped the overarching range of the young king’s vision. The old general’s thoughts were of immediate advantage in a local campaign, Alexander’s of ultimate victory on the stage of the world. That could be won only by feeding success with success. ‘He would not risk sacrificing the skill and courage of the Macedonians; should they lose the engagement it would be a serious blow to their warlike prestige.’ He would instead proceed with his reduction of the Persian naval bases along the coast and so ‘defeat the Persian fleet from the land’. This was an extraordinarily incisive piece of strategic judgement; an obvious analogy is with MacArthur’s scheme at the outset of the South Pacific campaign to outflank Japan’s naval advantage by seizing only those islands that he needed as stepping-stones northward, leaving the rest ‘to wither on the vine’. Alexander’s decision, like MacArthur’s, was justified by results. After the reduction of the last great Persian fortified ports at Tyre and Gaza in 332, the Persian fleet began to disintegrate. Its squadrons were recruited from precisely those Phoenician cities that Alexander had made his targets and, as one after another fell, the crews lost heart and made for home. As winter approached, Alexander’s admirals were no longer outnumbered and had regained control of the whole of the Aegean. By then, of course, Alexander had also won his first direct engagement with Darius, at Issus, in November 333. The shock of defeat had so unsettled the Great King that he had offered the invader a bribe well calculated to buy him off: the whole of Asia Minor, not only a territory of great wealth but also the homeland of all those Greek colonists whose subjection by Darius had supplied the initial motivation for the Persian expedition. Isocrates, its ideologue, had actually urged that the capture merely of Asia Minor would be justification enough of the risk entailed, but Alexander had already rejected this in the most insulting terms. After the fall of Tyre, when Darius improved his bid, offering the whole of his empire up to the Euphrates, from which Alexander was still 500 miles distant, and also threw in the offer of a large cash sum and his daughter’s hand in marriage, Parmenio at once urged Alexander to accept. Alexander’s famous reply was that ‘he would indeed have done this were he Parmenio but, being Alexander, he would do no such thing’. He had already told Darius that since Issus he was Lord of Asia, that the Great King’s money and lands were therefore already his, and his daughter’s hand also, if he chose to take it. Alexander could never have been accused of lack of boldness. After Issus, however, he had reason to feel bold. More impressive, and more indicative of his fundamental character, was his boldness at the Granicus, where he and Parmenio differed over the tactical scheme for the battle. 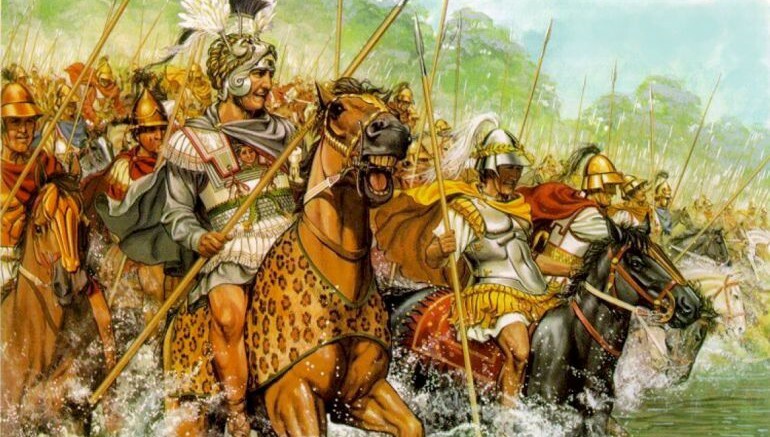 The Persians, holding a river position, had brought their line right down to the river’s edge, thereby, as Parmenio warned, threatening a Macedonian attack with disaster. ‘As we emerge in disorder, the weakest of formations, the enemy cavalry in good solid order will charge.’ Better, he proposed, to camp for the night, wait until the enemy had done likewise, and get across the watercourse when it was unguarded. Alexander would have none of it. ‘I should feel ashamed,’ he said, ‘after crossing the sea from Europe to Asia so easily if this little stream should hinder us … I consider it unworthy either of the Macedonians or of my own brisk way with danger. Moreover the Persians would pluck up courage and think themselves fighters as good as we are …’ And so, clapping spurs to horse, he ordered the advance and plunged into the Granicus. Arrian, the old campaigner, whose account tallies closely, thoroughly approved. Alexander, he says, had good military reasons for shunning a night operation. But, more important, ‘the secret attack by the Greeks under cover of night would excuse Darius from any confession of being a worse general with worse troops’. Alexander, now deep in the heart of the enemy’s empire, had not only to win but to be seen to win unequivocally if the campaign were not to protract itself interminably. All or nothing: Alexander played for all, and won. This entry was posted in Ancient Warfare, Biography by MSW. Bookmark the permalink.